Although this week has been snowy here, the season has been warmer than usual. 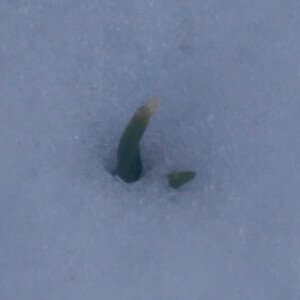 I noticed last weekend that some of my spring bulbs were starting to send up little shoots, as if they’d somehow gotten the idea that winter might already be over. I was going to take a photo, but then it snowed, and all that could be seen was the tip of one hyacinth peeking through the snow cover. I have to wonder if I’m going to get any blooms out of them this spring, as early as they’re coming up. But, I have to say I admire their optimism! Tomorrow I will have to go out and look to see if any of mine are making an appearance! Already? wow, this one is in hurry! Here everything is white and gray, cold very cold! But being optimistic always help. Have a great week Meg! It’s very cold here today as well, but forecast to warm up later in the week, so maybe they’ll survive for now.